Buddhism and Nationalism cannot sit side-by-side. Nationalism is by nature the propagation and attempted sustaining of myths of identity. Those who choose to be attached to such notions, do so in disregard of the true, absolute reality that everything is transient, impermanent and in constant flux, whether it be the individual, society, culture, traditions and even ethnicity. Everything changes in time. Old myths get replaced by new myths, so what is the point in fighting against the inevitable? To do so is like trying to paint all the autumn leaves green, in the hope of deluding oneself that summer has not gone. 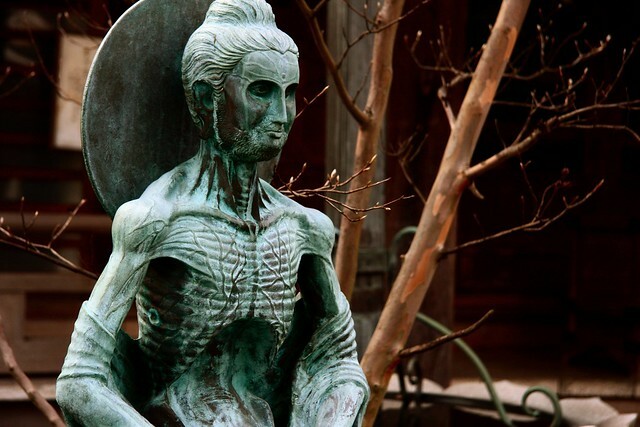 In contrast, a core part of the Buddha’s teachings is to accept impermanence. By doing so, we surrender ourselves to the natural processes, no longer grasping onto the unreal, which creates the friction that produces suffering. We should accept the impermanence of all phenomena, including the fleeting breath that is our own existence. There is nothing to grasp onto, and if we do, we are not grasping truth, just merely illusory phantoms of fancy, including our sense of self. Instead of standing against the winds of change in all our delusional, egocentric glory, fighting for this or that ideology and national identity, it is far better to let go of all that, and become the wind itself, rather than be separated from it. If we choose not to, we only postpone the inevitable. The wind will always conquer in time. Of course, tribal mentality is deeply wired into human beings, and a sense of community is important for our well-being. Whilst this might be natural, the reality of impermanence supersedes this. My piece was really trying mainly to bring attention to those who call themselves “Buddhist”, but so strongly identify themselves through a nationalistic prism, that it seems they have lost something in their practice. Some even committing violence in the defense of national identity. Unless we at least attempt to adhere to the basic precepts of the Buddha’s teaching, we have no right to call ourselves “Buddhist”. Not that this label is itself even necessary. This adoration of flags, anthems and past glories that some have, seems so ridiculous once we embrace the truth of impermanence. Even those “past glories” which are applied so thickly by nationalists as vindication of national greatness, themselves change in time. One has only to think how perceptions of General Custer’s Last Stand have shifted over time. In the 1940s, the Errol Flynn movie, They Died In Their Boots, glorified Custer and his men. However, by the 1970s, this view had been completely turned on its head, with sympathies now falling towards the Sioux and Lakota tribes, whose lands were being overtaken for gold mining. Viewing the world through the prism of impermanence, while a potentially scary prospect, because former “certainties” in our identity are lost, it is however the correct way to see the world and ourselves. I stumbled upon the blog as I was searching “Buddhist” as a tag. I have my own blog canadianbuddhism.wordpress.com where I try and write for canadians. I don’t think I’ve ever seen a statue though that captures the buddhas ascetics days so well. Just wanted to say wow great picture!